Angela M. Carter ‘09 has been shaped by hardships: she’s a survivor of childhood sexual abuse and of a lifelong battle against depression. But Carter, a talented, emerging poet, has also been shaped by many achievements and strengths. She traces some of these accomplishments back to the supportive environment of Cohort 52 in Eastern Mennonite University’s Adult Degree Completion Program (ADCP). As she continues to strengthen her voice and work to heal others, Carter wants to be known equally for her hardships and accomplishments, for they both shape her identity and contribute to that empowered voice – one that defies the victimhood and stigmatization she wants to help fellow survivors escape. In England, Carter capitalized on several years of experience with computer installation and repair, becoming an IT consultant and working in web and graphic design. For five years, she also co-founded and ran “Parentbaby,” an e-commerce site. She met and married her husband in England, and while visiting the Shenandoah Valley, they decided to move and raise their two daughters – now ages 10 and seven – in Harrisonburg. Carter sought stability: “a place to belong, a place to be.” But moving to a strange city without friends or career connections prompted her to seek further education. She found EMU, and “everything aligned” with scholarships and enrollment. “There was never a moment when I thought, ‘This isn’t right,’” she says. Her classmates understood that “it was not easy, whatsoever,” to be both parent and student. Though deeply depressed throughout some periods of the program, she never missed a class. Her classmates were a diverse collection of people, but through meeting weekly, they developed a camaraderie. “I haven’t encountered that kind of friendliness outside the program,” says Carter. Through such moments of connection, Carter began to gain confidence in herself, and a sense of personal identity and worth. “I became ‘me’ while I was there,” she says. Two and a half years ago, Carter began to publish the poetry she’d written in secret throughout her life. Reviews have said that her poetry is “hard to read” because of the subject matter, but Carter counters that “the truth is beautiful, even when it’s not fun and games.” Nominators of the Pushcart Prize and Virginia Literacy Award agree. She also works as a visual artist, often combining art shows with poetry. Carter’s family has rallied around her work. Her mother, with whom Carter did not have a positive relationship for most of her life, was originally “dead against this book coming out.” But after reading the manuscript, she told Carter that “she now understands why the caged bird sings.” Her mother is now one of her largest supporters. 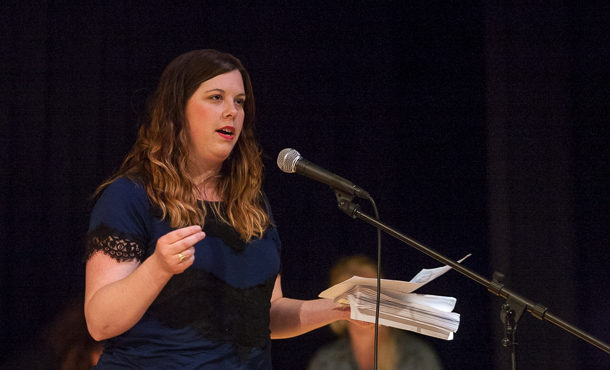 After each poetry reading, Carter has received an outpouring of emotional feedback. Often, people approach her in tears, unable to speak. She recalls young adults who have “a gleam in their eyes” after a performance, saying they would start writing because of her. The message she hopes to impart to her listeners is that “there’s a lot of solace in knowing that you’re not alone.” Carter encourages anyone who is dealing with depression and trauma to read about mental illness, and learn about the societal prevalence of their struggle. Breaking the stigma and loneliness surrounding mental illness is paramount to healing, she explains. For Carter, some of that healing is rooted in her experience at EMU.